Cinderford is the first forest town to offer free wifi to residents and visitors. The Town Council project will provide an hour free wifi each day to people in the Triangle at the heart of Cinderford. Free wifi will also be available in the Town Council offices and meeting rooms at the Belle Vue Centre. Since joining the council in 2015, Cllrs Turner and Witham have been promoting the benefits of free wifi and working on solutions to get it installed. 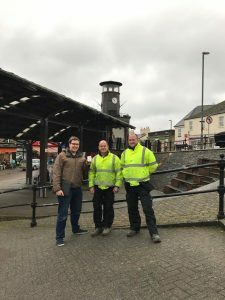 Inspired by cities like Bristol and Oxford who have seen free wifi rolled out as part of the Government’s £150m Super Connected Cities Programme, they wanted to bring the benefits to Cinderford but couldn’t access the government’s funding. Initial quotes for the project were over £10,000 with expensive ongoing fees. Clerk to the Council, Lynda Thomas explained, “Through using our own workforce and the expertise of our Councillors, we’ve been able to deliver the project for a fraction of the estimated price.” The council have committed to running the project for an initial three year period and if successful, will look to extend this. But the deal got better still. When Cllr Witham heard of the planned closure of HSBC’s branch in the town, he organised a meeting with the bank’s regional managers over Twitter. Cllrs Holder and Witham met with HSBC Managers to discuss the closure and put forward their plans for wifi access in the town. Cllr Witham said “HSBC have registered that more people are banking online and whilst they offered free wi-fi in the branch until it closed, not everyone has access to high speed internet at home. We had a productive meeting and saw a great connection.” After the meeting, HSBC offered to make a donation to cover the installation costs of the project as part of their legacy to leave the town well. An online YouGov survey, conducted in 2016 revealed that around 43% of Britons are frustrated by the lack of free, public WiFi networks available in the UK, while one in four people would be more likely to stay longer in a town centre with access to free WiFi. Cllr Turner, a taxi driver, said “Customers often ask me where they can get free wifi, it’s becoming a necessity and it’s obvious that it will drive an increase in visitors to our town”. HSBC will also offer “Alternative ways to bank” drop in sessions in the Council’s training room in February, making use of the new wifi to show residents how they can bank online. The sessions will run from 9:30 to 12:30 every Tuesday in February.